We can achieve a youthful look through balanced diet along with using natural products onto our skin. Collagen and elastin are the skin proteins mainly responsible for elasticity, tone, texture of the skin. These two skin proteins give strength and durablity to the skin. 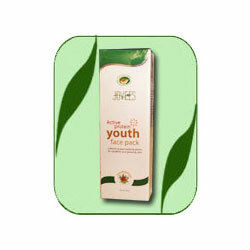 This youth face pack contains argan oil, anti-oxidant and peptides along with other active ingredients derived from natural source that to help promote surface skin cell turnover, mitigate the fine lines by accelerating the cell renewal process, improve skin texture and helps skin to be firm and youthful. Almond, honey, wheat, Arganoil, soya protein.